I’m bored. I need to take a few moments away from this tedious document I have been asked to work on. Maybe I’ll work on describing the recipe for my lunch today. 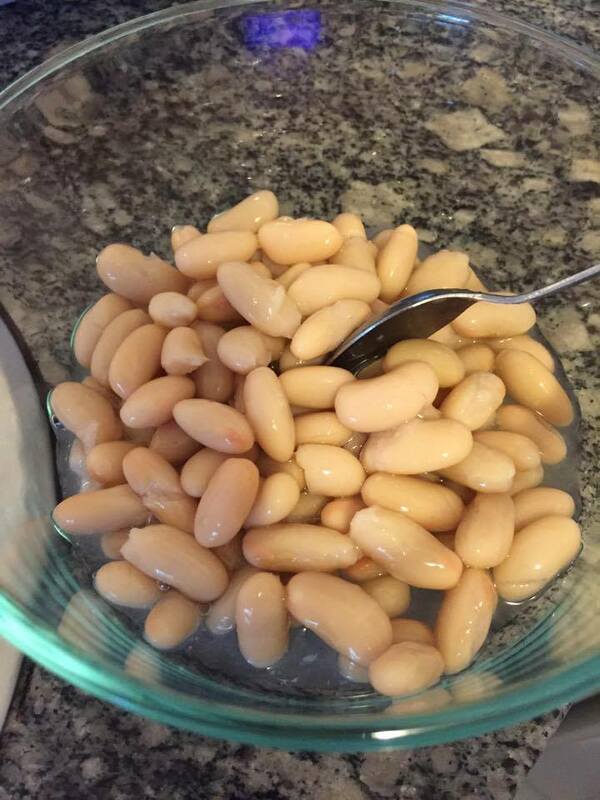 A seafood bean salad. First get some beans. A can will do. In fact that is the whole idea of a workday lunch. It must be in a can. The nutritional values of beans out of a can aren’t inferior to beans which thumbed their rounded noses at such a wonderful convenience. It costs far less than beans stored or managed in other ways and the contents remain protected and unblemished by time and other elements which usually render food less palatable. Care must be exercised when lifting the ring that is attached to the container as it is known to come off quite easily before completing its task. Like an elderly man is wont to do with respect to some bodily functions. This step is delicate. Lose the ring and you’re in strife. Open the lid too much and you’re in strife too but the next day. You do this by gently lifting the ring just a few millimeters before inserting your index finger through the ring. Once firmly in the ring, hold the index finger down firmly onto the edge of the ring before embarking on the next, delicate step of slowly but firmly pulling the ring away from the edge of the lid, ensuring no jerking action is involved. 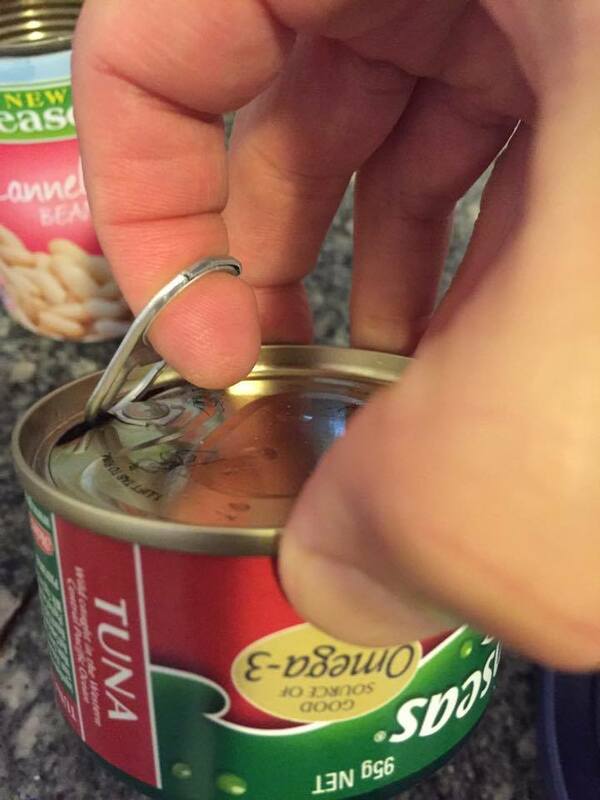 Do this in one slow and continuous action and you will see the lid coming away from the can, revealing beautifully canned beans. Do not remove the lid all the way. Pull the ring back about half way, just enough to drain some of the liquid and later, scoop out some of those lovely beans. You want to remove the liquid as otherwise the salad edges closer to a casserole, which I often pretend it to be when I don’t perform the next step with the care it requires. Once the lid is open for about a centimeter or so, slowly push the lid back to keep the beans in the can as one pours out some of the liquid. You don’t want to pour out all of the liquid because the tenet of a workday lunch of this sort is economy. This requires retention of say one half of the content of your now opened but ready to drain beans, for use in another workday down the track. Slowly drain about just under half of the liquid. Drain it straight into the sinkhole. Take care however, to aim the draining at the center of the sinkhole. Otherwise you mess up the sink and it sets you back in terms of one of the secondary objectives of a quick, economical and convenient workday lunch which is to minimise mess and cleaning up. It also saves you a bit of dosh in terms of detergent etc. With the required amount of liquid drained, gently tip out some of the beans (about half) into a container. You can if you wish, use a teaspoon for this. The washing up is fine as the spoon can be re-used for mixing/tossing anyway. 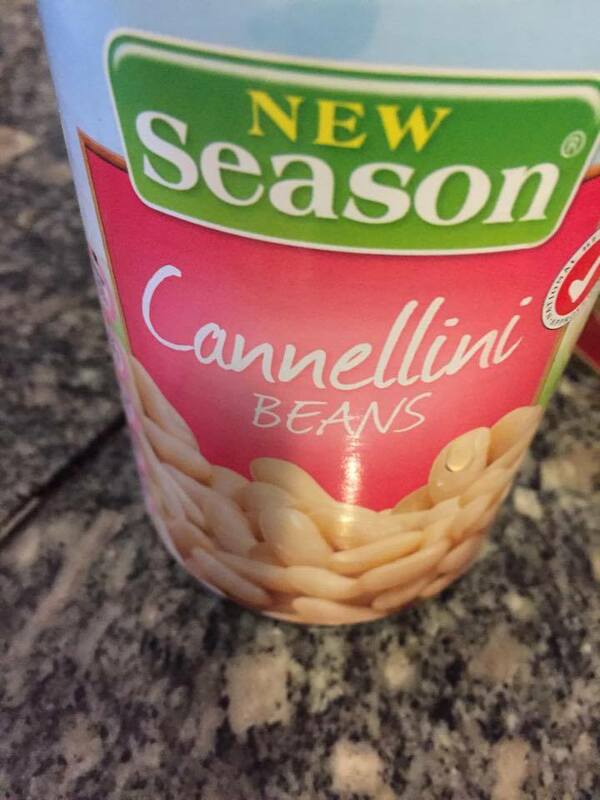 Leave the beans in the container and stand back. Have a look at the first element of your salad. Make sure it does not have too much of the liquid that was in the container as it may otherwise look, taste and act more like a casserole. 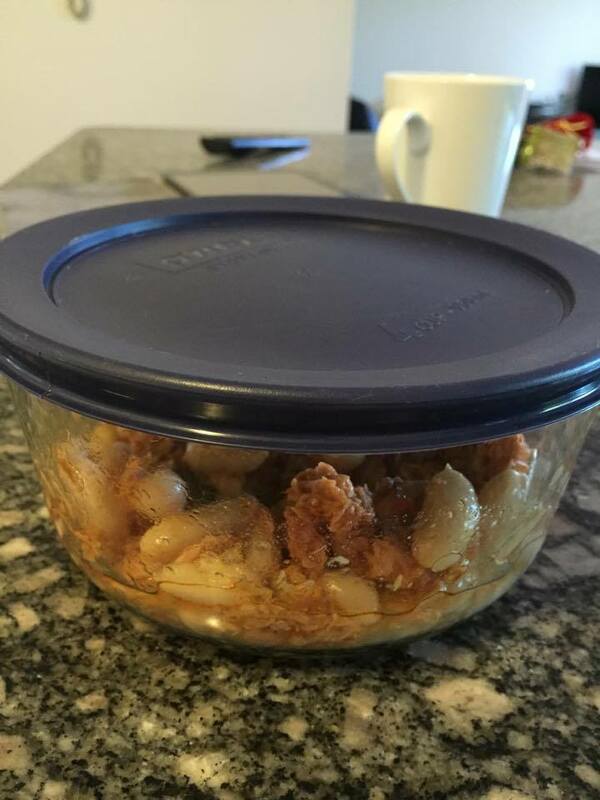 Once you are satisfied it is moist without being wet, set it aside by leaving it in the container without the lid on. This will further dry the beans. When safely set aside you may then proceed with the second (and final) element. This is a seafood salad so selection of seafood is essential. You can use shellfish but the country of origin of such products is questionable these days. Hygiene and integrity or purity of product can now leave consumers in doubt. For this recipe I have selected a fish. Some may say this fish is suffering from fish stock stress from as a result of over-fishing or comes with the stigma or perils of commercial fish farming. What trumps these considerations however are the principles that govern and dictate the choice of a workday lunch. The elements of cost and efficiency override concerns of social responsibility for everyday consumption as one otherwise becomes spiritually pure(r) but never gets past a smugness that borders on a weak bank. This fish is economical and in the form I have chosen, it comes with all the advantages I have described for the first element. The canning process is far superior to bread slicing technology man often attributes to be the best invention. In this form, you also have the advantage of choosing the flavouring, which in turn further achieves the objectives of economy and efficiency. There is no (or less) need for seasoning or dressing. Depending on the beans you have selected, you may want to choose something which adds some spice and sweetness to the salad, such as sweet chili. The selection is easy as the flavour is also emblazoned on the can. Like I said, canning is a wonderful invention. However, the can means you apply the same amount of care and respect to this element as you do for the first. Repeat the process of carefully extracting the fish. Again – as before – gently lift the ring that is attached to the can and then give it your finger. Insert that finger through the ring and gently lift it so that the lid opens ever so gently. Then with a firm and sure stroke lift the ring to pry open the lid. 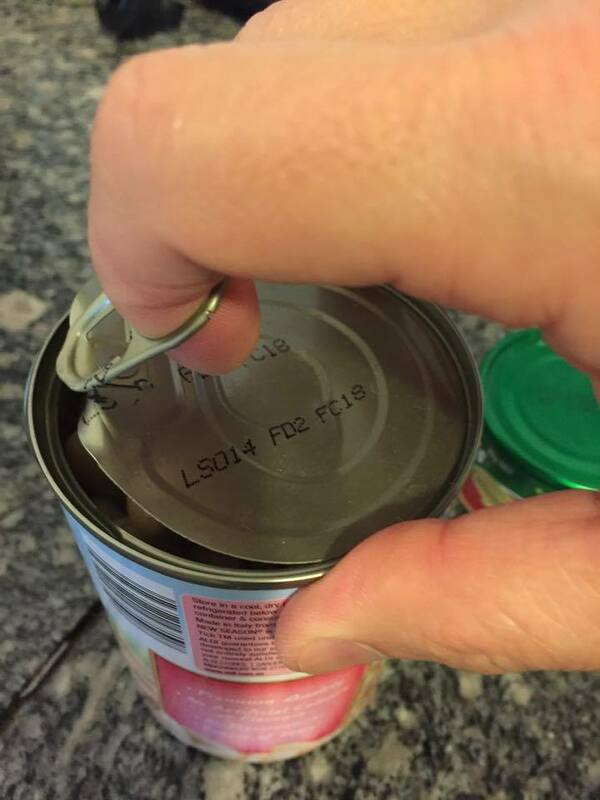 Open the lid as much as possible without completely tearing it away from the can. Leaving the lid attached to the can will again save you some time and effort in terms of cleaning up and discarding the can. 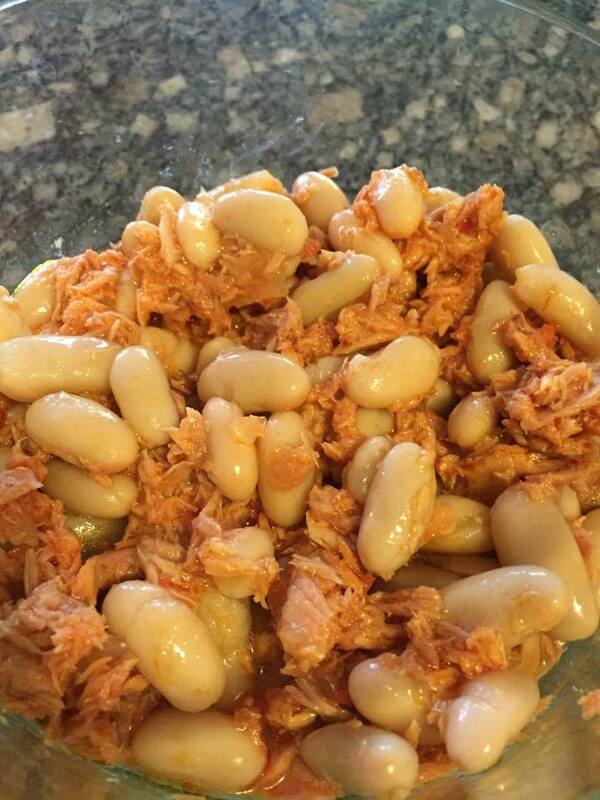 Using the teaspoon you had used to remove the half can of beans, remove all of the fish from the can. You may in the interest of cost and efficiency, place the fish straight into the container with the beans. Spread it out over the beans as much as possible. This will save you time in a later step. 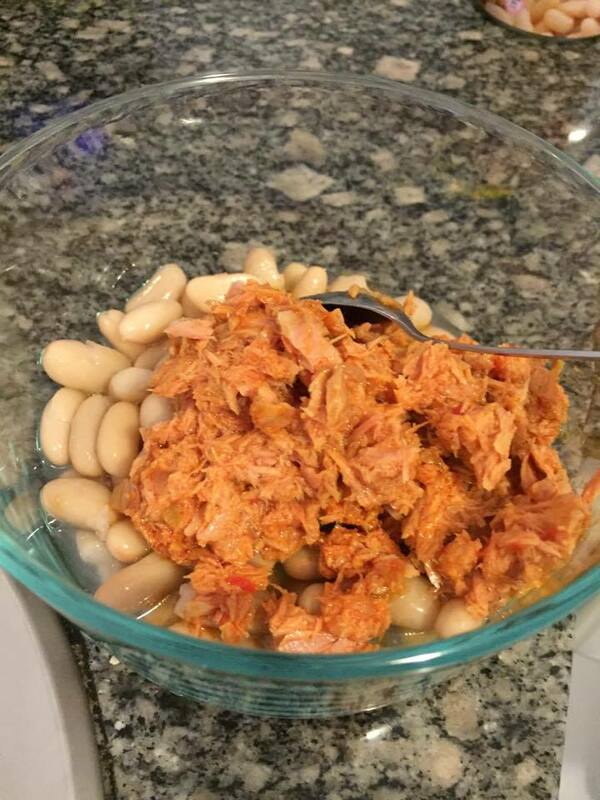 It also helps you see if you need to say, dress the fish and beans with say, some olive oil to add some moisture and texture to the salad. Finally, give the salad a mix. Stir it well but don’t over work it, particularly if you use beans which are soft and delicate. Sometimes I use other legumes such as lentils which is fine and would allow you to stir and mix all you want. It really doesn’t matter what legume you choose. They all make you do the rudest thing and provide not much difference in nutritional values. Taste matters but again, remember the context. Context is king and often makes one look far wiser than one really is. This is work lunch we’re dealing with. In my case it all starts and ends at my desk. No one sees or knows what happens but yourself. And it is all over within 10 minutes (depending on what you read on the internet at that time). With little between them the choice of legumes really comes down to cost. I often get mine for a dollar a tin. Ditto the seafood. The result can be very satisfying. I’ve made mine dry enough to still call it a salad so I ensure the dish is well stored in the fridge at the office until it is time for service. No need to plate up. Glassware is clean, hygienic, sustainable and aesthetically pleasing. The notion that one starts to eat with one’s eyes cannot be harmed by this recipe plated up on glassware. Keep it closed and refrigerated and Arthur Balfour! Or, to put it more conventionally, Bob’s your Uncle! Recall I said we keep half the beans for the next time? 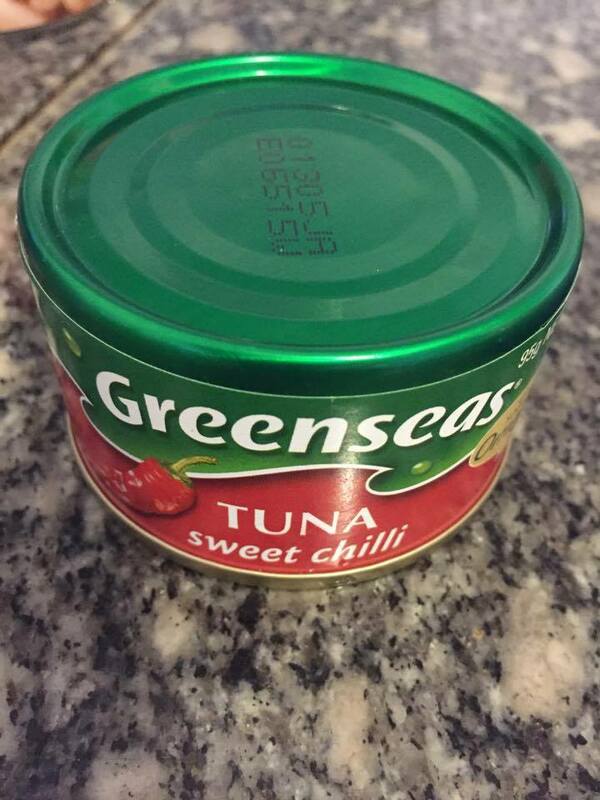 With only half a tin used each time, my lunch is often a very economical dollar and a half. That allows me room for dessert. I choose a seasonal fruit. Although, with global trade enhanced by the great Trans Pacific Partnership Agreement now in place, the term “seasonal fruit” seems to be losing its impact. We had strawberries through winter and with temperatures now soaring into the high 20’s or low 30’s I still get sweet juicy oranges. And economical too. A whole bag (of say 6 fruit) can be had for a mere $3. So with half a dollar for dessert which is sweet, succulent and makes you go like no other dessert can, the total cost of a very easy, nutritious and complete lunch is a mere $2. I should say the time I have taken to write/make this entry is the entire amount of time I have taken to prepare such lunches this whole entire week, combined.